A Saudi woman who was stopped in Bangkok as she was trying to travel to Australia for asylum to escape alleged abuse by her family will not be sent anywhere against her wishes, the head of Thailand’s immigration police said. 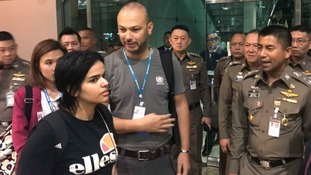 Rahaf Mohammed Alqunun, 18, was allowed to temporarily enter Thailand under the protection of the UN refugee agency, which was expected to take at least five to seven days to evaluate her case and claims for asylum status. Thai immigration police released photos of Ms Alqunun after she left the room at a Bangkok airport hotel where she had been holed up. Ms Alqunun had stayed in the room while sending out desperate pleas for help over social media. She began posting on Twitter late on Saturday after her passport was taken away when she arrived in Bangkok on a flight from Kuwait. The agreement allowing her to leave the airport came after officials from the UN refugee agency, known as UNHCR, met Thai immigration police chief Major General Surachate Hakparn, and then with Ms Alqunun. UNHCR declined to release any details of its meeting with Ms Alqunun, but its representative in Thailand Giuseppe De Vincentiis noted "a good spirit of collaboration so far" with Thai officials. Ms Alqunun's father has arrived in Bangkok and according to Maj Gen Surachate, officials would now see if she is willing to depart with him. The Major General said: "As of now, she does not wish to go back and we will not force her. "She won’t be sent anywhere tonight," Maj Gen Surachate said at one of several news conferences at the airport. "She fled hardship. Thailand is a land of smiles," he said. He added: "We will not send anyone to die. We will not do that. "We will adhere to human rights under the rule of law." On Twitter, Ms Alqunun had written of being in "real danger" if forced to return to her family in Saudi Arabia, and has claimed in media interviews that she could be killed. Ms Alqunun’s planned forced departure on Monday morning was averted as she stayed in her hotel room, with furniture piled up against the door, photos she posted online showed. Her plight mirrors that of other Saudi women who in recent years have turned to social media to amplify their calls for help while trying to flee allegedly abusive families. Ms Alqunun’s Twitter account attracted more than 50,000 followers in less than 48 hours and her story grabbed the attention of foreign governments as well as the UN refugee agency. Her pleas for asylum have also brought international attention to the obstacles women face in Saudi Arabia under male guardianship laws, which require that women, regardless of their age, have the consent of a male relative - usually a father or husband - to travel, obtain a passport or marry. Ms Alqunun told Human Rights Watch that she was fleeing beatings and death threats from her male relatives who forced her to remain in her room for six months for cutting her hair. Phil Robertson, deputy Asia director for Human Rights Watch, said Thailand should give Ms Alqunun back her passport and let her continue her journey to Australia. "She has a valid Australian visa," he said. "The key thing is she should not be sent back to Saudi Arabia, she should not be sent back into harm’s way." Maj Gen Surachate challenged parts of Ms Alqunun’s story, including her claim that she had an Australian visa. However, he did not show her passport. "The fact is she didn’t have any money," he said. "She intended to come here and didn’t have any visa to go to Australia. "So we have to state the facts here. But we will provide assistance nonetheless." Ms Alqunun had been travelling with her family in Kuwait, from where she may have chosen to flee because it has fewer restrictions than her homeland on women’s travel.